The above photo is from the Occupy Wall Street Farmers March from the La Plaza Cultural community garden to Zuccotti Park. You can see more of Tim Schreier’s photos here. 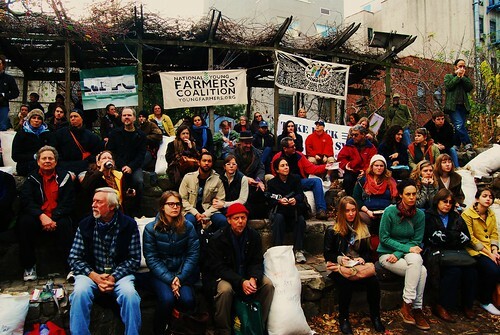 On Sunday, about 250 participants (by EV Grieve’s estimate) marched to promote “dialogue, solidarity and solutions to corporate control of our food system,” according to a flyer. EV Grieve notices candles outside of Joe’s Bar commemorating the recent death of its owner. EV Grieve notices that animal shelter Social Tees has moved from East Fourth Street to Second Street near Avenue A.
Ephemeral New York wonders whether the wishbones at McSorley’s were actually hung by soldiers going off to war, as legend has it.